You actually do need to put a little bit of oil into the air fryer to get the crispy edges on your foods, but air fryers require 70-80 percent less oil than traditional fryers. Additionally, air fryers have drip pans that collect a substantial portion of the excess oil (your arteries will thank you). An alternative is to go oil-free and allow the fat drippings to add the crisp texture; even if you decide to go this route, there is still a lot of excess fat to discard in many cases. Less oil, less fat, better health. A few years ago, when air fryers first hit the market, recipes were extremely sparse. But there are now hundreds of tasty recipes you can try out in your air fryer, including donuts and spring rolls. But you will have fun playing and exploring. You will work out how to use your air fryer to make your favorite foods and have fun playing with variations. Air fryers work really fast. In fact, for hot, crispy-on-the-outside, soft-on-the-inside fries, you might only wait 8-10 minutes from the minute you pop them into the tray to the minute you place them on the plate. A chicken breast can be air fried in around 12 minutes. The chicken could even go in first, and then after four minutes you could put your fries in so under 10 minutes later you are ready to serve a healthier version of chicken and chips. Crispy, golden fried chicken has never been healthier because of the air fryer. If you live in an apartment and enjoy fried foods or even steak then you would know the smells associated with them that can set into your clothes and furniture. Air fryers do not release as much of a smell because they don’t use much oil. If you air fry steak, chicken or lamb then there will still be a smell because these foods carry their smells in the air, but it will be more where near as strong or long lasting as when it is cooked on an open hot plate or in a normal fryer. Have you ever dreamed of cooking pasta…in a fryer? Just about anything can be cooked in an air fryer, and that includes macaroni, spaghetti and rice; all you need to do is fill an air fryer cooking tin with boiled water and set your timer. Cooking times vary depending on exactly what kind of grain you are cooking, as well as the amount. The air fryer makes life easier. This means that you can buy a packet-mix cake, follow the instructions to prepare the batter, pour it into your air fryer tin and in 10 minutes you are done. And the result? A cake that is soft and moist on the inside but with a little crispiness on the edges. And why do you want a cake crispy on the edges? Because it really does taste that good. A key tip is to use only half of the batter per fry. If you use half of the batter then you can bake two cakes and serve them as two cakes or one double-layer cake. Another benefit of air fryers is that they are relatively compact — you can store your air fryer with ease if you need space in your kitchen. Even if you live in a tiny studio apartment, you can easily store an air fryer while maintaining a minimalist style. The air fryer could soon become your favorite kitchen appliance as you have fun exploring sumptuous recipes or creating your own concoctions. 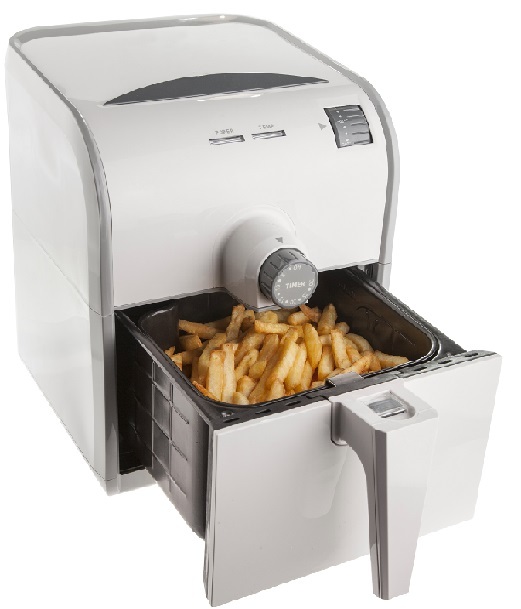 Get your very own air fryer now with Cash Back through DubLi.com and begin your life of fantastic flavor, low fat, and easy frying!